As seen on TV, the petite but powerful MiniMax is an all-in-one charger that can give all your devices a boost on the go. 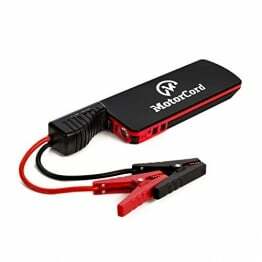 Jumpstart a disabled car, power or charge your mobile devices, and get to safety with a powerful LED flashlight, all with this one versatile device. The innovative MiniMax features an advanced lithium-cobalt battery and jumper cables to jumpstart dead batteries in cars, trucks, motorcycles, boats and more. For added convenience, the compact charger also has a built-in LED light with three modes and a 5V 2A USB port to quickly charge devices without the need for an outlet. All of these features are expertly designed into a compact tool that safely and conveniently stores in your glove box or handbag. This is a must-have safety device for everyone in your family. Make sure your car always has a back up power source with the MiniMax Portable Power Pack! Includes: 1 power pack – 1 set of jumper cables – 1 USB cable – 1 car charger – 1 carrying pouch. Simply charge the unit at home by plugging the provided connection cable to any USB wall charger (not provided) such as that of an iPhone.